← Video Games – Can they make learning fun? That is one heck of a picture huh? Anyway I read this article on Gizmodo talking about three pieces written at the Washington Post. Yep, I’m writing about an article that was written about three other articles. That’s pretty avant-garde. At any rate these articles discuss the shift that is happening in journalism. While none of them actually agree on the state of journalism, they do recognize that the Internet and the availability of news online is the cause of this change. It got me thinking, what has the Internet done to force education to change? Are we in a major shift right now? If so, what is that shift and what direction is it heading. It seems pretty clear that newspapers will continue to get smaller and that self journalism will continue to grow, but what about schools, teachers, curriculum, textbooks and education in general. There is definitely a lot of talk going on, but what will it yield? It is not so easy to see or answer these questions. We hear at IT Babble want YOU the informed reader to give us your opinion. Give us your thoughts. 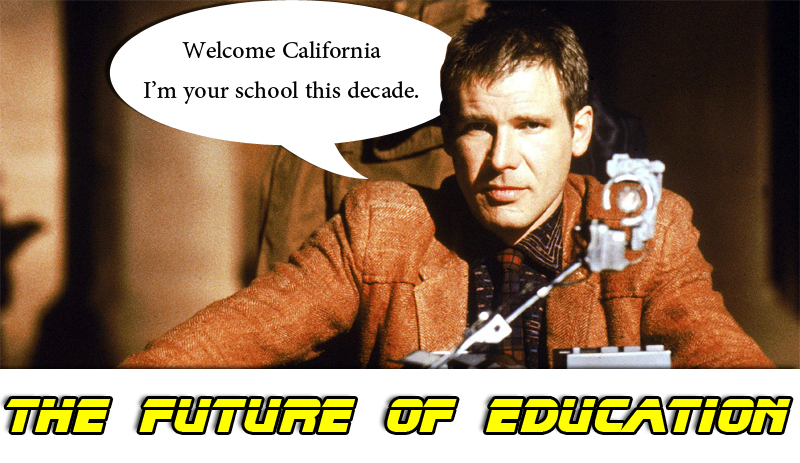 Give us your crazy dreams of schools in the twenty-fourth century. What does tomorrow bring? Will we all be working for the Khan Academy in 10 years? Tell us your vision of the future of education. In case that was too subtle, we want you to leave a comment please. Omar and I feed on them like candy corn. I see a the future right now. Our school (high school level) has adopted a personal electronic device policy that allows the students to use their smart phones, tablets, and laptops in the classroom. Realistically — students will never be banned from using their resources at work, so why limit them in the classroom? Currently the use is at the teacher’s discretion and there is a great level of respect for this privilege. The students can quickly research facts to support their argument in class, they can gather images for a project just by snapping a picture on their phone, and they can even respond to teacher generated questions using Poll Everywhere. And to me, we have just begun to scratch the surface. Just think if this progresses over the next few years the school technology budget can be used to amp-up the network, hire more Instructional Technology Coaches, and incorporate more technology based professional development! Thanks for coming back! That sounds so encouraging to see this happening. I am really intrigued about allowing students the use of their personal devices in the classroom. In your opinion are the benefits outweighing the negatives. You may want to check out this service then. http://www.socrative.com. I haven’t written about it yet, but plan to. It works with any device that can connect to the web. No need for an app. It’s free and looks awesome. I also am encouraged of hiring more instructional coaches. Right now how many does your school compared to your teacher population? Do they also teach any courses? Just wondering for my own information. The positives are definitely overpowering the negatives because we are focusing on creating a culture of respect. As the principal says, “We need to keep the devices on the table instead of under them.” I have never seen socrative.com before, but it seems wonderful! I cannot wait to spend a little more time looking at it and developing a way to use it! About instructional technology coaches, we have 2 coaches in the district (5 schools, one is middle & high school and the other is the 3 elementary schools). But we also have a unique intern process through a local university. There are about 10-15 students that work as technology interns for the district to provide immediate, hands-on professional development and co-teaching assistance during the use of technology. This program is actually how I started in the district last year. The teachers really appreciate the immediate support in and out of the classroom. I am using Socrative today in my class for the first time. It was so easy to set up! The excel template is really user friendly and it only took a few minutes to set up. However, I already have some things about it that I don’t like. First, the fact the images cannot be embedded within a question. To get around this I am projecting my images on my smartboard and the question will be sent to their device. Also, once your create a quiz, you cannot reorder the questions unless you recreate it or re-import it once you make the changes in excel. That is promising that it was easy to set up and get going. It sounds like there were no problems on the technical side. I imagine that they don’t allow images to keep upload and download speeds pretty quick. That is a bit disappointing about not being able to reorder or give a quiz by randomizing the questions. Ah well, I guess we can’t have it all. Do you think this is a tool that you can use in the future or will you wait for more features? I did run into a few technical problems as the day progressed, but they were the fault of the school’s network not socrative’s. I am planning on using it again. There are just too many perks not to! All of the results come packed in this easy to decipher spreadsheet, alphabetized by student’s name, correct in green, incorrect in red, and best of all the total score and percent are listed! The format keeps the students engaged and on task. I am looking forward to the updates, whenever they come, but until then – I will still be using Socrative. I see a world full of information, but unsure what to do with it. It will become the job of educators to help students learn to harness that information. Educators will need to show students how to untangle the web of information. Thanks for stopping by. Omar and I love comments here at IT Babble. I think you are almost on the right track. It will not become the job of educators to help students learn to harness that information. It IS the job of educators to help students learn to harness that information. As a teacher we need to use technology effectively and engaging in our classrooms right now. It should facilitate and enhance the learning process and it needs to bring something new to the table. For example, if someone is using Animoto to present information how is that any different than someone using PowerPoint back in the 1990’s? Is it because it is online? Is it because people can leave comments? How does it enhance the learning process? However, if they use a blog to present that information and the teacher promotes that blog to their local community, then it brings in a number of different voices to give their opinion, their experience and in some cases their expertise on that topic. It becomes something more. It becomes a living document that can evolve and hopefully change people’s outlook on a topic. Since a student is personally linked to it, the blog, comments and reactions have meaning. If that happens, you now have a flexible platform to reach beyond your local colleagues and learners. You have something that has the ability to teach that child long after the textbook has closed, school bell has rang and long after the teacher has left the room. Take IT Babble as an example, I’ve learned so much from writing on this blog in the past year that I know I’m a better educator for it. It challenges me to be better because I see excellent examples of teaching with technology on other blogs everyday and know that I could, that I should be doing that in my class right now. The blog has motivated me to go beyond the status quo and look to how I can be doing better. Our job is more than just showing students how to sift through information online.